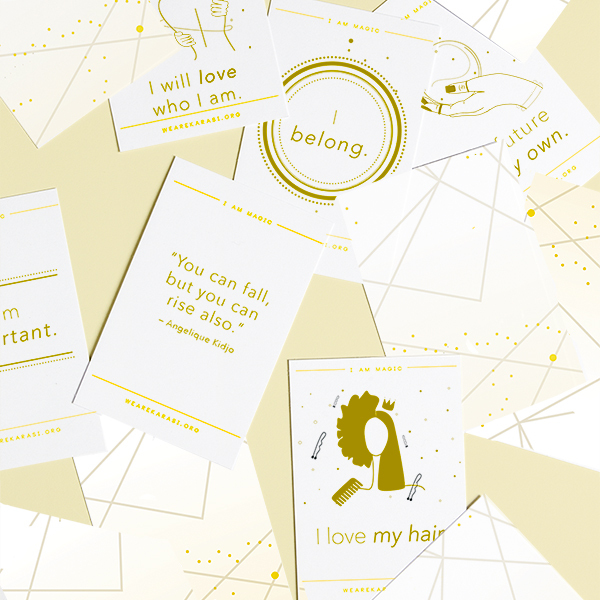 Affirmation cards designed specifically for womxn of color. For us, by us. Change your mindset, change your life. Affirmations are power! *Featured in the October 2017 Black Butterfly Subscription Box! Affirmations have the power to change your mindset and help you empower yourself. I Am Magic Affirmation cards are available in a set of 25 cards designed to promote self-love and celebration amongst womxn of color. They are a distinct and thoughtful gift for yourself or any womxn who needs to be reminded that she is strong, special and deserves to be celebrated. Dimensions: 2.6in x 3.6in, 25 cards in a velvet pouch for easy transport. – Read the card aloud and think about each word. Visualize the words. – Reflect on what you are reading and think about each affirmation as an action, not a thought. – Repeat The Affirmation(s) 3-5 times. – If needed, carry the card with you or place it in a place that is highly visible. I would love to hear how these cards help you, please email hello@wearekarasi.org or tag @wearekarasi on Instagram and let me know!